Now that spring is arriving, contractors are preparing for a busy work season. Many times this also means needing to invest in equipment like cranes, forklifts, and manlifts to tackle large projects planned in the constructions season ahead. Having the right equipment is essential to ensuring your projects proceed smoothly and profitably. Inadequate or worn out equipment can cost you money lost productivity and increased maintenance. Investing in the right equipment now, though, helps to make sure your construction season is a success. Fortunately, finding the right equipment in Missouri does not need to be difficult. Rackers Equipment is ready to help contractors start the season right with our extensive inventory of quality, used construction equipment like cranes and lifts. Our inventory includes equipment from respected manufacturers like Furukawa, Koehring, Grove, Terex and Lorrain. Investing in high-quality preowned equipment can help you stay on budget as the construction season gets underway. Purchasing used cranes and lifts saves money up front on the purchase cost, while also limiting depreciation of the equipment. Good-quality, used construction equipment can also still provide many years of reliable service, meaning that they’re a savvy investment for the discriminating contractor. After more than 30 years of experience in the construction industry, we are prepared to help Midwest contractors with all of their construction equipment needs. 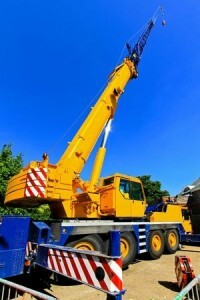 Need more than a crane or lift? Rackers Equipment carries a wide variety of construction equipment, including primary and secondary crushers, feeders, screens, wash equipment, bins and conveyors, scales, scrapers/water wagons, dozer and truck loaders, compressors and drills, loaders, backhoes, excavators, trucks and more. Browse our full inventory online to see what we currently have in stock. Each piece of equipment that is listed includes detailed specifications, helping you determine if it’s the right machinery for you. In addition to our used inventory, we also carry more than a dozen lines of new equipment, as well. Call us today at 573-635-8700 to see how we can help you with your equipment needs this season.